From page one, writer Shawn Aldridge and artist Scott Godlewski put the reader on edge, earning their Vertigo stripes and removing any hope for The Dark & Bloody #1 being a feel-good read. The story begins at Black Lick Hollow in Kentucky in 1992, as Iris Gentry has been tasked with disposing of an unwanted litter of pups. From there, it shifts to Al Anbar, Iraq in 2004 before returning to Black Lick Hollow in the present day. Iris has been to hell and back, or, depending on how all this plays out, left one hell for another. Whatever the case, the five pages split between seven-year-old Iris and his nineteen-year-old self in Iraq paint the gestural framework of Iris’ history, the rest of which is set to unfold over the course of this series. Aldridge tells the tale through Gentry, using nearly every one of Clem Robins’ utilitarian caption boxes for Gentry’s narrative to the reader. That exposition sets the stage, establishes Gentry’s voice, and gives readers a sense of the baggage present in the protagonist of this story. Iris Gentry is, as the sheriff puts it, a hillbilly making moonshine. That moonshine serves as a secondary source of income, keeping Gentry’s family afloat, the fractures of which inform and introduce Sarah and Shiloh, Gentry’s wife and son. Aldridge makes the moonshine as integral to the tale as the ink on the paper, giving readers a plot thread from which this story is spun. Truly collaborating with Aldridge, Godlewski brings his experience from Copperhead to the more terrestrial setting of Black Lick Hollow, drawing lived in houses, worn-down fences, stowed decorations, tangible cars, and a functional still among the backdrop of the Hollow. He also gives colorist Trish Mulvihill lighting cues and shadows to work through and around, enhancing the mystery of The Dark & the Bloody. Detailed when it needs to be, but deceptively simple and inviting the rest of the time, Godlewski’s art is simply breathtaking. The artist excels in delivery economy of line, something art professors preach, but students struggle to adopt. In The Dark & the Bloody #1, readers are treated to an example of what that should be. That mystery that is only partially glimpsed around Godlewski’s crafty page construction grabs the reader’s attention, shifting the spotlight and ratcheting up the dread of things to come. In addition to the PTSD Gentry has brought back from his time in Iraq and the stress of providing for a family with supplemental illegal means, there is a mysterious beast roaming the edges of these pages. Aldridge and Godlewski only give readers a sample. A taste. A demonstration of the beast’s power, but nothing of the motivation. The mystery comes with a helping of anxiety that is exactly the type of atmosphere Vertigo books have established their reputation through. Aldridge won me over with his work on Go-Getters (see my Ten Tweets Thursday). Godlewski did the same on Copperhead. Put the two of them together and post it in the Vertigo solicits in an issue of Previews three months prior to shipping? That’s just teasing. The end result, however, is worth the wait and then some. A little bit Revival, a little bit Wytches, and a whole lot of its own mysterious, captivating beast, The Dark & the Bloody #1 has all of the requirements a debut issue should have, with some extra horror thrown in. If you’re one of the myriads of readers looking for something different, or something riveting, or something with humanity and soul, or something with mystery, or something dark, or something bloody, or something fresh, go now. 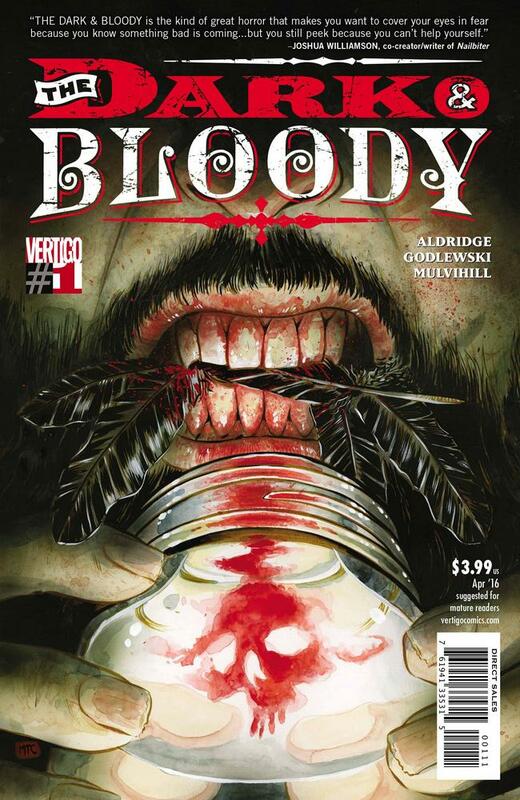 Get The Dark & the Bloody #1, then thank Aldridge and Godlewski for inviting us on the journey ahead.